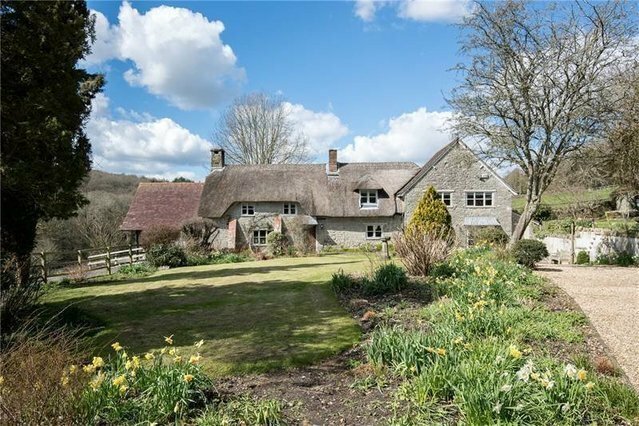 Harcourt Farm is set in a wonderful rural setting with views over the local countryside. The house is part thatch, part tiled and built with stone elevations. Beautifully presented throughout, many period features have been retained including inglenook fireplaces and exposed beams. The house is also very light with many rooms being dual aspect. The drawing room has a large inglenook fireplace with jet master and leads through to the oak framed garden room which has views across the valley. The kitchen/breakfast room which has an excellent range of cupboards with wood worktops, central island and a range cooker. There is plenty of space for a dining table and there are French doors opening out onto a terrace. There is a further sitting room with fireplace, utility room, shower room, boot room and wine store. On the first floor are four double bedrooms, two of which have fitted wardrobes, and a family bathroom. The house is approached through a five bar gate with the drive leading to the parking area. Alongside the drive way is a useful stone building which has been converted into a large double garage, home office with cloakroom, stables and loft room and could be converted into a separate self-contained dwelling. The main lawned area of the garden lies to the front of the house which has well stocked flower and shrub borders. There are two terraces adjacent to the house which make the most of the views over the countryside. To the north of the house is a small orchard, with a third terrace, which leads to the paddock. To the south of the house is a wild garden that gently slopes to the river Stour.